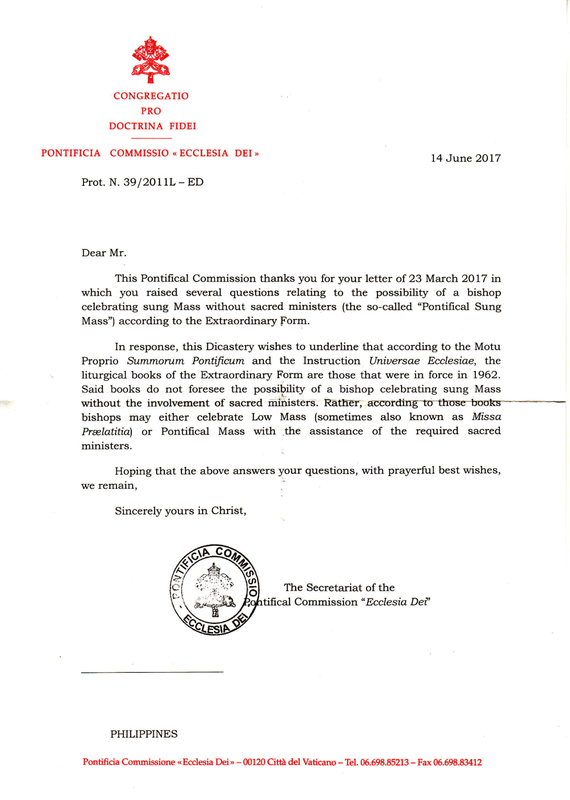 Earlier this year, this Choir sent a dubium to the Pontifical Commission Ecclesia Dei requesting clarification on the status of the so-called Pontifical Sung Mass, which from time to time has been celebrated by bishops and cardinals for communities attached to the Extraordinary Form. Pontifical Low Mass celebrated by His Excellency Mons. Athanasius Schneider, Auxiliary Bishop of Karaganda in Kazakhstan, in the Church of Gesù e Maria in Rome on 22 November 2009 (image from Orbis Catholicus secundus). We received the response (dated 14 June 2017) two weeks ago (click on the thumbnail to view). The PCED clarifies that the books to be used for the Extraordinary Form, according to Summorum Pontificum, are those in force in 1962 . As of 1962, a bishop had the option to celebrate either a Pontifical Low Mass  or a Pontifical Solemn Mass . The possibility of celebrating a Sung Mass more sacerdotali was only opened to bishops through Inter Œcumenici, issued by the Sacred Congregation of Rites, dated 26 September 1964 . Universæ Ecclesiæ, on liturgical discipline, clarifies that “by virtue of its character of special law, within its own area, the Motu Proprio Summorum Pontificum derogates from those provisions of law, connected with the sacred Rites, promulgated from 1962 onwards and incompatible with the rubrics of the liturgical books in effect in 1962” . The provision of Inter Œcumenici, therefore, is deemed derogated in the Extraordinary Form. Art. 1: AAS 99 (2007) p. 779. Cæremoniale Episcoporum, lib. I, cap. xxix. Op. cit., lib. II, cap. viii. Cap. II, no. 48i: AAS 56 (1964) p. 888. Cap. III, no. 28: AAS 103 (2011) p. 419.